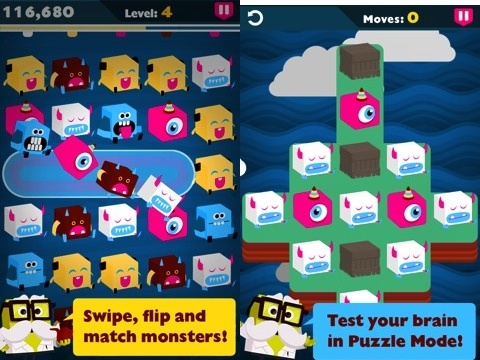 Monster Flip by PikPok is a universal puzzle game for iOS where users need to match up three monsters of the same color to remove them from the puzzle. You select a series of three to four monsters to flip them around. When you flip the monsters any that line up are removed from the screen and new monsters appear. There are four modes in this app: classic, puzzle, countdown and sequence. In Classic mode, you want to rack up as many points as you can before you are overrun by mad monsters. When a mad monster appears on the board, you have three turns to remove him by matching him up with two other monsters. When you fail to match up a mad monster, the turn is over. You need to beat level one Classic up to level three to unlock the puzzle mode. In Puzzle mode, you need to complete puzzles. Puzzle mode contains 60 monster flip puzzles. Your goal is to get three stars on each puzzle. In Countdown mode, you play Monster Flip in a timed mode. You get two minutes to gain as many points as possible. In Sequence mode, you play a combination of moves to truly master the iPhone app. The main menu for Monster Flip shows the Play button, Flipzopedia button, Options button and More button. Play sends you straight to playing the puzzles. Flipzopedia tells the back story for the application and gives instructions. You don’t need to know the back story of the iPhone app to play. Options lets you turn off the music and sound effects. The music is a sci-fi music theme with occasional monster blips. I found the music to be off-putting and quickly used this option to turn it off. The More button lets you explore other games, merchandise and music. The actual puzzle shows twenty monsters in four rows. You use your fingertip to select monsters. In the top left corner you find your score for the turn. In the middle of the top status bar, you find your current level. The Flipzopedia menu is full of information about the app including the story line, the monsters and the humans. The story line displays as flash cards explaining what each monster does and how the story came into being. The monsters are cartoon characters with their own story line. You also get instructions on playing and pro tips for mastering the puzzles. The graphics for this program are quite impressive. It is a two dimensional program but it looks great on the retina display. It is very colorful while still being tasteful. The main menu splash screen shows a scrolling background that is visually stunning. Monster Flip by PikPok is quite challenging as far as puzzle apps go. It takes a little bit to get used to the concept. I found the game to be entertaining and plan to play the application again. PikPok works on the iPhone, iPad and iPod touch. This review was completed using an iPhone 4 running 5.0.1 iOS. 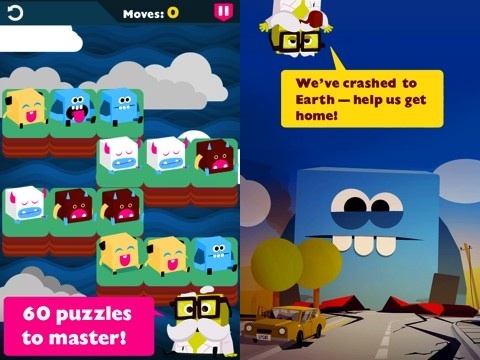 AppSafari review of Monster Flip was written by Darius Reimm on April 6th, 2012 and categorized under App Store, Arcade, Games, iPad apps, Puzzler, Universal. Page viewed 4050 times, 1 so far today. Need help on using these apps? Please read the Help Page.